These oatmeal cookies are a gem. I have recently been on a kick trying out vegan and gluten free recipes. One of my dear students: Dominika Paleta, a celebrity artist, influencer and health foodie shared the original version of this recipe on Instagram and you know that feeling: when you immediately see a recipe you like you NEED to go make it immediately? Well that happened and it was pretty late at night. I continued making several versions of this recipe and even bars which came out pretty amazing. Then I discovered Mammoth bars and fell head over heels with these paleo, gluten free, clean bars (with NO weird stuff). Believe me I have tried a ton of health bars because I travel a lot and need a travel snack that is ideal for me (gluten free, paleo, low sugar, with added super foods) that gives me energy and fuels me to have the vitality to teach and be in the go. 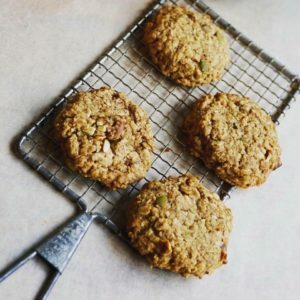 My favorite of these bars (I had the pleasure to try them all is: the Goji Berry Trail Mix (which actually inspired me to create this cookie recipe, please note the bars are NOT vegan). What is great about this recipe? 1. It’s vegan (no dairy, no honey, no eggs). 4. It has umami: packed with memorable flavors. 7. You can make these immediately (so practical). 8. They are chewy and low in sugar! Use code: chefvanessa to get 10 % discount on Mammoth Bar (it is an affiliate link). I HIGHLY recommend them! Gluten free, oatmeal vegan cookies. The perfect snack. Sift flours, baking powder and salt in a large bowl. In a large bowl with a whisk: mix coconut oil, coconut sugar, water, vanilla. Add oats, baobab, and flours. Mix in seeds, almonds, pistachios, goji berries with a plastic spatula. Refrigerate the dough covered for a few hours so that the dough sets and the oats get softer. Prepare a perforated baking tray with Silpat. Shape cookies with a medium scoop and slightly shape with your hands to soften edges. Flatten cookies lightly and bake for about 15-20 mins until golden (they must be crisp on the edges and soft inside). Remove from oven and let cool on a cookie rack or on the perforated tray with no Silpat. Store in a plastic container (I use a recycled washed salad container). The cookies will keep well for 3-4 days. Hey Buddy!, I found this information for you: "TRAILMIX COOKIES". Here is the website link: https://www.vanessamusi.com/trailmix-cookies/. Thank you.